During your exam, Dr Rich will thoroughly examine your teeth and gums for signs of tooth decay, gum disease, and other health problems. Using the ORAL ID, oral cancer screening device, Dr Rich will screen for any signs of cancer concern. Dr Rich will most likely want to take Digital dental X-rays to see what is happening beneath the surface of your teeth and gums. These images will help Dr. Rich discover dental issues not visible to the naked eye. Next, your hygienist will carefully clean your teeth with a variety of tools to remove any plaque and hard mineral buildup (tartar) from your teeth. Then your hygienist will floss your teeth, use a polishing compound, and apply fluoride. 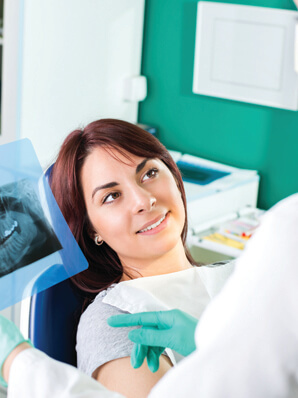 Cleanings usually aren't painful, but if you have any anxiety about your dental exam and cleaning, be sure to let your hygienist know. They may offer several sedation options to ensure your comfort. If your dentist or hygienist finds tooth decay or gum disease, they will talk to you about changing your brushing or flossing habits. In severe cases, they may recommend antibiotics or other dental treatments. If your teeth and gums appear to be healthy, your dentist will probably recommend that you continue your brushing and flossing routine as usual and return for your recare appointment in six months.